Several recent releases of various investor sentiment reports show an improvement in overall investor sentiment. In late December I noted a number of the sentiment measures were indicating extreme fear on the part of investors. Since my December post both sentiment and the equity market have experienced a marked improvement. 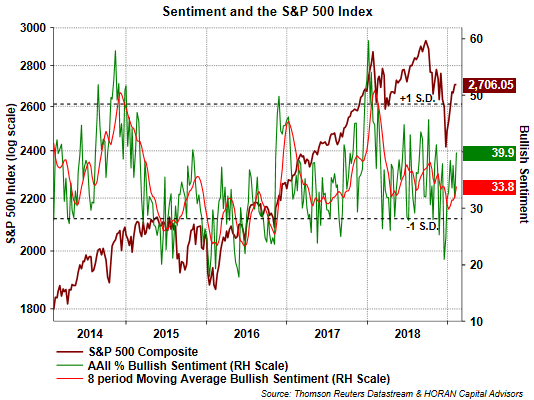 One example is this week's release of the AAII Sentiment Survey. Individual investor bullish sentiment improved 8.1 percentage points week over week to 39.9%. In mid December the bullish sentiment fell to 20.9%. Although the bullish sentiment level of 39.9% is an improved level, it is just above the long term average of 38.5%. Also, newsletter writers sentiment has improved since December. 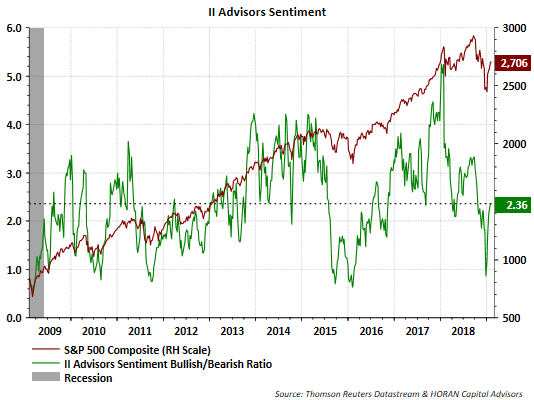 The ratio of the bullish to bearish advisor sentiment ratio has increased to 2.36 from .86 in December. Of course a ratio less than 1.0 indicates there were more newsletter authors with a bearish stance than a bullish one. The Investor Intelligence Advisors' Sentiment Survey studies over a hundred independent market newsletters and assesses each author’s current stance on the market: bullish, bearish or correction. Lastly, the Fear & Greed Index published by CNN Business was about as low as it could get last December, i.e., extreme fear, when it was reported at 3. The most recent reading has the Index at 62 or just slightly above average or in the Greed range. For investors, much of the sentiment has improved and is being reflected in the market's recovery early in 2019. And as I noted in yesterday's post, Higher U.S. Stock Prices Not Driven By Higher Domestic Equity Inflows, investor actions are not leaning towards overly bullish as fund outflows from equities continues. The sentiment measures are contrarian measures and more actionable at their extremes and current readings seem mostly at average levels.